Bureau Local is is a new collaborative journalism project of more than 450 journalists and volunteers who work together to tell vitally important public interest stories at a local level. Because local journalists are crucial in holding power to account. The Bureau Local tackled some of the most important and underreported issues of 2017 including the use of political darks ads, new election voters, cuts to domestic violence refuge funding, immigration officers incorrectly targeting British citizens and wide-scale farming pollution. Below you can find three articles. For the whole project click here. Three months ago we launched the Bureau Local, a new wing of The Bureau of Investigative Journalism dedicated to uncovering local public interest stories in the UK. For a tiny team of four, we’re ambitious. From day one, our aim was to collaborate instead of compete, use technology instead of chase it and most importantly, work with local voices in order to tell the stories that matter to communities across the UK. We want to spark a new wave of data-driven investigative reporting in the UK. We started out by travelling – to Bristol, Leeds, Manchester, Glasgow and Oxford – and talking to local reporters and tech groups to identify stories, tech challenges and interest in collaborative journalism. Yet it wasn’t long before our ‘let’s listen and learn and build from there’ plan was forced into overdrive. Three weeks after our launch, Theresa May called for a snap election. The public was in shock and the press began counting the days until June 8. Several local reporters told us they had little time and resources to cover the flurry of announcements or run election investigations. Our team barely knew each other, let alone knew how to galvanise people across the country, but we knew we couldn’t sit still. If we were dedicated to bringing people across the UK together, to act as a resource for journalists and a centre point for collaboration on a common issue, this was it. So, we jumped in. A week later we announced we would be taking on the election and launched a community platform for people to join us. 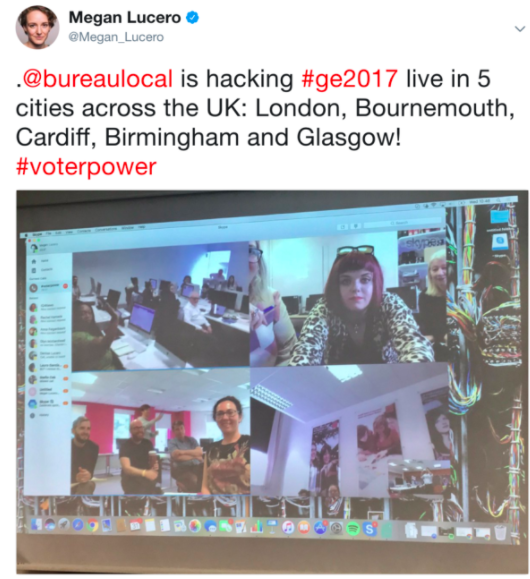 Six weeks after that – as voters headed to the polls – our team of four had grown to encompass a network of more than 350 regional reporters, bloggers, civic tech workers and others, spanning 84 cities across the UK. By the time votes were cast, the Bureau Local network had investigated voter power, targeted political advertising on Facebook, reporter access to the party leaders and political crowdfunding, producing 77 stories in total. Together, we tackled some of the most important and underreported issues of the campaign and we did it innovatively, in depth and from various corners of the country. As the result of a hung parliament was sinking in, we had proved that the Bureau Local was not just possible, it was crucial. Below we go behind the scenes in each of our election investigations and open up our workings and our data. Two days before the election, we revealed that new voters and those without their previous party standing had the power to swing 71 seats. The Bureau Local and the local reporters that worked with us were the only ones to identify these power groups ahead of election day. 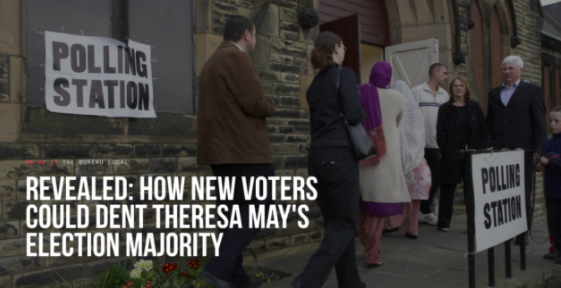 Despite the widely assumed belief that May would not lose her majority, on June 9 the results revealed that assumption to be wrong and that nearly half of the seats we had identified had indeed swung. This unique analysis came about at a collaborative hack day we held a week before polling day. The Bureau Local built a robust database using demographics of the UK electorate and worked with two statisticians to estimate and verify registration figures (because there is no central database). From education to age, to those registered and not, the Bureau Local pulled together information in order to find out who has the power to determine the result in their local constituency and how that reflected national trends. With only a week’s notice, 65 people came together in five cities across the UK – Glasgow, Cardiff, Bournemouth, Birmingham and London – to dig into the database and find stories for their own communities. Two journalists in London – Matty Edwards and Ed Fairhead – started looking at how our estimated registration numbers compared to the majority held by the incumbent in the seats they cover – Croydon Central and Colchester respectively. They found these seats had an increase in voter registration larger than the 2015 winning margin. They also looked at the numbers of past UKIP and Green voters and found constituencies where those parties were no longer standing. The Bureau worked with Edwards and Fairhead and expanded their measures across across the UK to reveal there were 71 seats where these ‘partyless’ voters were greater in number than the majority held by the incumbent MP, meaning they had the power to swing their seat. The data continues to act as a resource. You can access the methodology and data in full here. 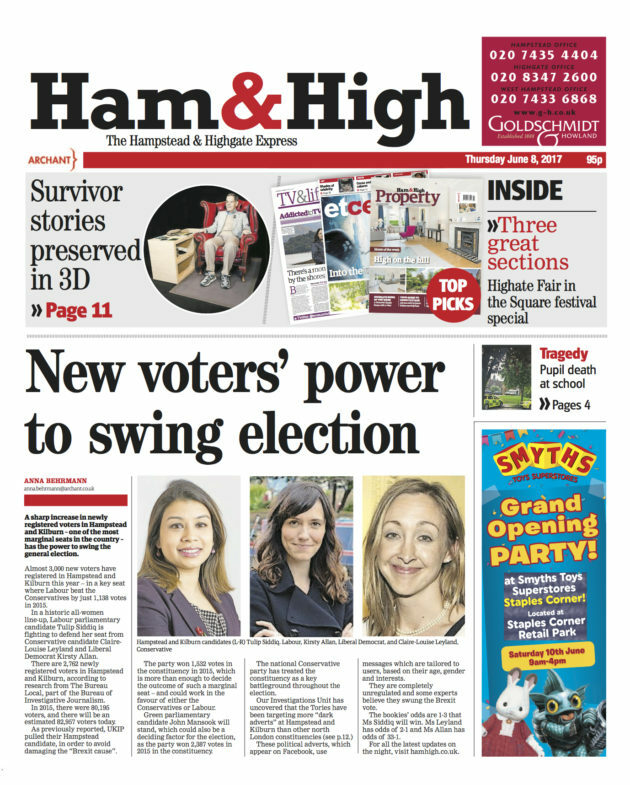 The modelling led to a national story in The Times and and 18 local pieces, including the front page of the Ham and High. 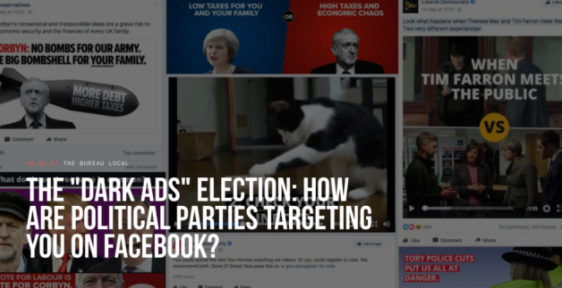 As the news of the snap election spread, many people began thinking about the role targeted Facebook ads might play in the upcoming campaigning. Facebook holds detailed data on users – ethnicities, occupations, locations, interests, etc – allowing anyone interested to buy ads that target specific people with specific messages. This ad can appear in individual newsfeeds without appearing on the Facebook page of the organisation that created it, meaning that unlike billboards or newspaper ads which everyone sees, the world of targeted advertising is ‘dark’ and hard to track. We knew these ads had been used in both the US presidential election and the Brexit referendum. The General Election was already being labelled “the dark ads election”, but no one knew just how true this was or how to go about finding it out. Luckily we had a solution. We partnered with Who Targets Me, a civic tech project that allowed Facebook users to track the political ads that were targeting them. We negotiated exclusive access to the local breakdown of the data for our network. By the end of the election the project had over 11,000 people onboard pulling in 16,000 instances of political ads, making it the largest database and user group of its kind. Ten local journalists joined us on the investigation. We pulled down the data relevant for their areas, gave them regular updates, shared ideas for ways to dig further and provided analysis of the national picture for context. The stories that came out of the data were fantastic. We saw 36 local stories in print, radio and TV, that pulled out local angles we could never have spotted. These included a front page in the Yorkshire Post, a fascinating deep-dive by BBC Scotland and some engaging data visualisations by The Bristol Cable. In addition, we contributed to four Guardian stories (including one on the front page), BBC Trending a Buzzfeed article and a New York Timespiece. The stories provided an unprecedented level of transparency in terms of how Facebook ads are used in election campaigns. We were able to tell both national and hyper-local stories and developed some great relationships with local journalists as we all grappled with a live and ever-changing dataset. Our investigation into journalists’ access to the leaders was prompted by the Prime Minister’s visit to Cornwall on May 2, during which local journalists were barred from filming her at a business in St Ives. Jacqui Merrington, digital editor of Cornwall Live, told Press Gazette her reporters were “shut in a room” for the duration of her visit and told they could only ask two questions of May, who did televised interviews with the BBC and ITV at the end of the trip. Following this report and other individual examples we were hearing from local journalists, the Bureau Local set out to build a comprehensive picture of reporter access across the country, something never before compiled. Over the course of the campaign we analysed more than 80 visits by all the party leaders to constituencies across the country, speaking to nearly 60 journalists in the process. 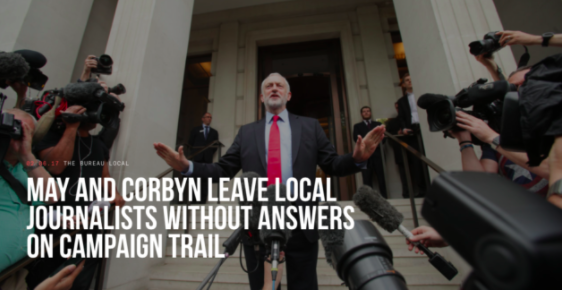 Our research found that while both Theresa May and Jeremy Corbyn had talked up the importance of the local press ahead of the election, neither had lived up to what they had said. Theresa May did more one-to-one interviews with local newspapers, but was more restrictive and less forthcoming in her dealings with them, failing to answer local questions with anything more than soundbites and requiring some reporters to submit questions in advance. Jeremy Corbyn left more than half of the events we covered without speaking to a local reporter, though when he did agree to interviews he was more open than his Conservative rival. The investigation proved an invaluable means for introducing reporters to Bureau Local and brought to light the barriers they faced when trying to hold party leaders to account for the public. Additionally, it was the one investigation that we worked on that showed how local experiences can combine to tell a national story, rather than the other way around. The story was also picked up and ran on The Press Gazette and Hold the Front Page. 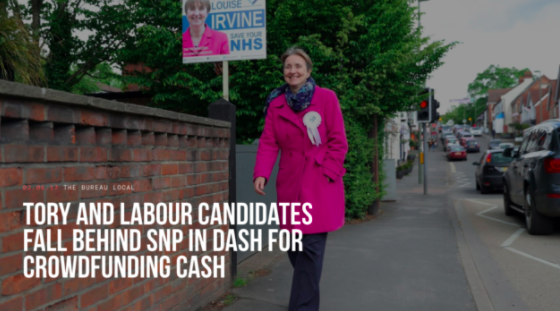 With the snap election catching candidates out of step, many had to get creative with ways to finance their campaigns quickly. We found that more than 300 candidates – including 63 former and current MPs – turned to the online crowdfunding platforms, Crowdfunder, JustGiving, GoFundMe and Crowdpac. They collectively raised more than £450,000 on these websites. To monitor how much each candidates raised, we built scrapers – code that collects information from webpages automatically. This tech allowed us to broaden the scope of our investigation and to create a previously inexistent database of electoral online crowdfunding campaigns. What grabbed our attention was that each website operated slightly differently. Several of the inconsistencies raised concerns about funding transparency in local campaigns. Two of the four crowdfunding platforms analysed, JustGiving and GoFundMe, have disclosed that they do not pass sufficient information to candidates to enable them to verify that donors are on the electoral register, which is required by law for donations of over £50. Even when sufficient information is provided provided, there could be further complications if donors sign up to the crowdfunding platforms with a name or address that is different from the ones under which they are listed under in the electoral register. These are all points that reporters and the public will be able to examine in local spending reports as and when they are released. Our work and our data is open. We hope you dig into it. In the lead-up to the election we ran a crowdfunding story on our site with The Ferret in Scotland and with The Huddersfield Examiner. This week we broke a story in a way we have never done before. We worked with an exclusive dataset that one of the members of our 400-strong local reporting network obtained. And then gave it legs. Because our local reporting community is pretty great at working together, one reporter with one dataset – shout out to Adam Cantwell-Corn – led to eleven leading pieces across the UK. On Monday, outlets across the country and the Bureau and Guardianjointly revealed that 19,000 British Citizens got swept up in immigration checks over the last five years. 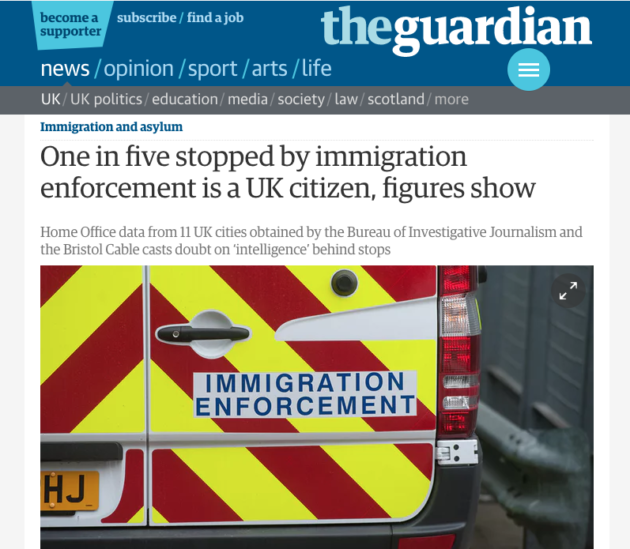 The data showed that one in five people stopped and questioned for immigration crimes in “intelligence-led” operations were British citizens. The findings led to eight members of parliament from London, Manchester, Birmingham, Leeds and Sheffield – including Afzal Khan, the Shadow Immigration Minister – to call for a review of Home Office practices (you can see their punchy quotes here). Human rights lawyers have accused the Home Office of racial profiling and demands have been made for the Home Office to provide transparency on why Brits were stopped. 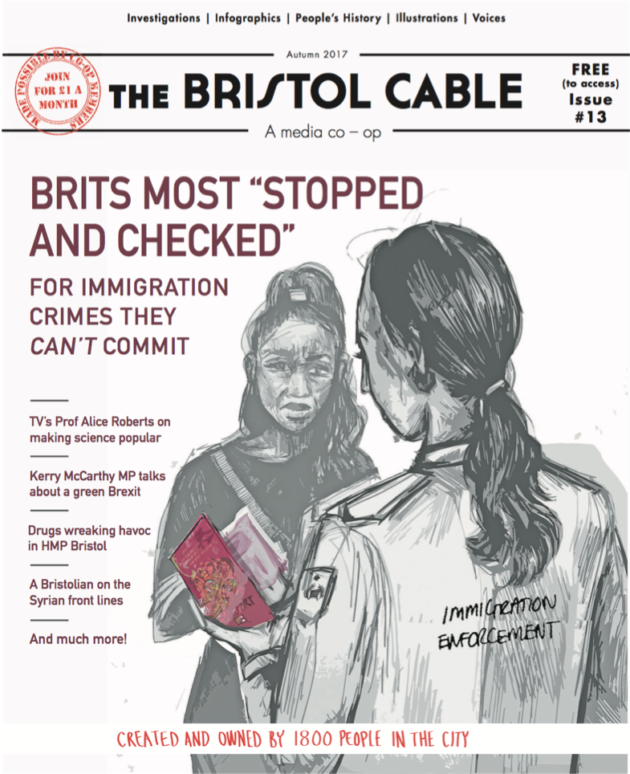 Data on the nationalities of those stopped by immigration officers was obtained by Adam Cantwell-Corn from the media cooperative The Bristol Cable, following a seven month Freedom of Information dispute with the Home Office. This data was not publicly available when the issue was in the spotlight four years ago. In 2013, the Equality and Human Right Commission wrote to the Home Office following complaints of racial profiling by immigration officers at transport hubs. At the time, the claims were dismissed by Mark Harper, the then Minister of State for Immigration, who had insisted that the operations were intelligence based. The data Cantwell-Corn obtained provided the first publicly available evidence to challenge the previous assertion from the Minister. But he didn’t keep it to himself. Adam shared the data with us at the Bureau who worked with him to analyse the findings and coordinate some local digging. And the sharing of this information led to powerful insights and results. Another journalist was able to get ahold of a Brit in Yorkshire who manages an Indian restaurant that was raided in August. The source said immigration officials stopped Asian staff over white staff and that the raid had hurt the business. We found 10 other reporters around the country – located in the cities that the data was available for – and over several weeks everyone shared leads, sources, quotes and case studies with each other. Because of the pressure these reporters placed locally, we had 8 MPs speaking out when the story broke. Public calls for action were made by Afzal Khan MP for Manchester Gorton and Shadow Immigration Minister, Stella Creasy, MP for Walthamstow, Tulip Siddiq, MP for Hampstead and Kilburn, Preet Gill, MP for Birmingham Edgbaston and Kerry McCarthy, MP for Bristol East. Additionally, concrete political actions were taken by two other MPs. Labour MP, Gill Furness, from Sheffield – the city with the highest ratio of British citizen stopped – and Thangam Debbonaire, from Bristol both wrote to the Home Secretary urging for a review of Immigration enforcement practices. The day after the investigation came out, Theresa May announced an audit on the impact of ethnicity on everyday life. An important part of the announcement was the launch of a new website dedicated to the disclosure of ethnicity data on areas like health, education, employment and criminal justice. While there is yet no pledge or action for data from immigration stops to be included in the audit, further calls have been made by both lawyers and MPs for the Home Office to capture the ethnicity of those they stop to safeguard against discrimination. Stories ran in the Bristol Cable, Yorkshire Evening Post, Liverpool Echo, Overtake, Ferret, Birmingham Eastside, Birmingham Mailand Sheffield Star. And there is more to come. Further reporting is expected to come out in Newcastle and Cardiff over the coming days. If you want to take your own look into this story, the FOI which contains data about London, Manchester, Birmingham, Glasgow, Leeds, Liverpool, Newcastle, Sheffield, Nottingham, Bristol and Cardiff is available here. If you’re not yet part of our community of reporters, join us by following the link below and help out with our next investigation. Across England domestic violence refuges are turning vulnerable women away, closing down vital specialist services and battling budget cuts, according to the Bureau’s country-wide collaboration. More than 20 reporters and volunteers across England – all members of the Bureau Local network – dug into council and police data, surveyed refuge managers and gathered powerful stories of women fleeing danger. We heard stories of refuges closing in Sunderland, Suffolk and Stoke; more than a thousand women turned away; and experts warning women and children will die as a result. It was the Bureau’s largest collaboration to date. The result was an in-depth look at refuge provision across the country. Influential Members of Parliament, the Labour leader, shadow ministers and top police chiefs have all spoken out in the wake of the Bureau Local’s findings. Jeremy Corbyn MP, the leader of the Labour party, accused the government of placing political policy before women’s welfare as he demanded action over cuts to domestic abuse services. Conservative MP Maria Miller, who chairs the Women and Equalities Select Committee, called for a statutory requirement on local authorities to fund refuges. Jon Cruddas, the MP for the East London seat of Dagenham and Rainham, told the Barking and Dagenham Post that the findings highlighted “deeply worrying concerns”, while the veteran MP for the neighbouring seat of Barking, Margaret Hodge, said she was worried by “the rise in high-risk cases in the borough”. Lyn Brown, MP for the West Ham constituency, spoke out over the pressures on domestic violence funding. “With reports of domestic violence on the increase it is absolutely wrong that the Tory government continues to underfund the council services that can help them,” said Brown. Senior figures in the police service have also expressed concern. Detective Superintendent Julie Wvendth, from the Norfolk constabulary, said domestic abuse was one of the force’s priorities, but added that an increase in reporting had led to funding not keeping up with demand. Tim Passmore, Suffolk’s Police and Crime Commissioner, said he was “horrified” at the way funding has been cut generally, but added that his office had put £150,000 this year into supporting the county’s three women’s refugees in Lowestoft, Bury and Ipswich. Two weeks after our story broke, the Department for Communities and Local Government opened a consultation for “improving access to social housing for victims of domestic abuse”. Over the course of five months, the Bureau Local worked with more reporters and helped produce more local stories than we ever have done for a single investigation. It also featured on Channel 4 News– the Bureau Local’s first piece on television. Our work started with Jasmine Andersson, who joined the Bureau on a fellowship sponsored by NCTJ’s diversity fund aimed at encouraging more diversity in journalism. She spotted a story from earlier in the year warning Sunderland’s refuge funding was in danger of drying up completely. We decided to explore the situation around the country – putting a call out to our Bureau Local network of reporters to dig into the issue in their patch. 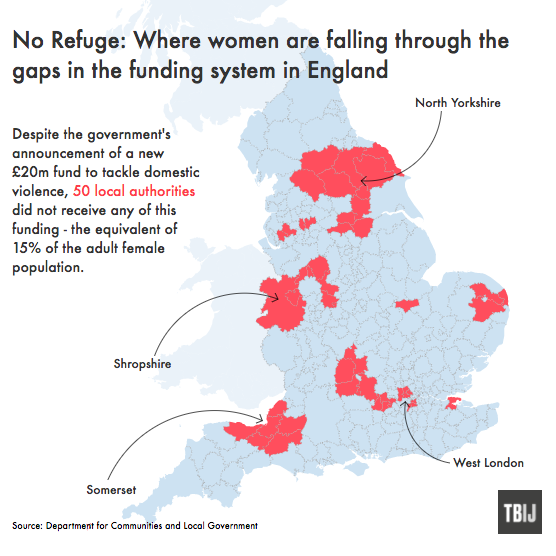 We collected data on refuge funding from local authorities across England. Of which, 84, more than half of authorities responsible, were able to provide data for the year 2010/11 and 2016/17. We obtained data from an additional 42 responsible authorities but they were unable to provide the data for those years. Other councils could not provide the data we requested. We also collected data on domestic violence incidents over time by putting in Freedom of Information requests to police forces across England. We also crafted an online survey for refuge managers. Our network took the survey and used it to interview their local refuge managers, allowing us to pull together comparable information and tell a nationwide picture. Finally, we asked local reporters to dig into the £20m pot of funding for domestic violence services announced by the Department of Communities and Local Government. Here at Bureau Local central, we used a Python script to pull out all the areas receiving DCLG funding and those that are not. This allowed us to calculate that 15% of the adult female population is not in an area covered by the fund. You can see our Python scripts and access the data here. Alongside all that data work we also went out and talked to domestic violence survivors and refuge managers to tell their stories. Stories have appeared in: Yorkshire Post, Ipswich Star, Norwich Evening News, Eastern Daily Press, East Anglian Daily Times, Times & Star, Birmingham Eastside, North West Evening Mail, Blackpool Gazette, Birmingham Mail, The Overtake, Lancashire Post, Hartlepool Mail, Wakefield Express, The Municipal Journal, Barking & Dagenham Post, Islington Gazette, Newham Recorder, New Statesman, Channel 4 News, the Independent, and others. Our journalists were: Jasmine Andersson, Sarah Cheverton, Tom Bristow, Emma Pearson, Lenka Pešková, Caroline Barber, Emily Davies, Robyn Vinter, Rebecca Omonira-Oyekanmi, Chris Burn, Dan Peters, Stephanie Soh, Emma Youle, John Blow, Alex Shaw, Paul Bradshaw, Luke Sproule, Lucy Todman, Emily Pearce, Carmen Aguilar and Giuseppe Sollazzo. Our beautiful illustrations were by Ella Paton of Viewfinder Studios.